On June 12, Disney's Phineas and Ferb will finally see the end of the longest summer on record in the series finale, "Last Day of Summer", airing on Disney XD at 9 PM. The series, created by Dan Povenmire and Jeff "Swampy" Marsh, premiered in 2007 and went on to be a ground-breaking animated series as it led to a renaissance of Disney TV animation paving the way for subsequent animated series such as Gravity Falls and Wander Over Yonder. Following the summer antics of inseparable step-brothers Phineas Flynn (voiced by Vincent Martella) and Ferb Fletcher(voiced by Thomas Brodie-Sangster) as they work to make the most of every day of summer through their wild inventions, it presented a wide cast of memorable characters as well as a seemingly infinite number of catchy songs including a theme song written by Bowling For Soup. Paralleling the story line of Phineas and Ferb were Dr. Doofenshmirtz (voiced by Dan Povenmire), an evil scientist who wants to take over the Tri-State Area, and Perry (voiced by Dee Bradley Baker), Phineas and Ferb's pet platypus who leads a covert life as Agent P of OWCA (Organization Without a Cool Acronym) overseen by Major Monogram (voiced by Jeff "Swampy" Marsh). These two nemeses, who actually have a deep sense of respect and regard for each other, duke it out in nearly every episode resulting in somehow causing Phineas and Ferb's invention-of-the-day to disappear before their older sister, Candace (voiced by Ashley Tisdale), can bust them. Widely loved by children and adults alike, this is an animated series that will be sorely missed by many and will not be forgotten easily. In recognition and celebration of this renowned series, we wanted to point out ten essential episodes that everyone should check out. These were the episodes that were particular standouts and are worth any animated fans' viewing time. I know what we're gonna do today guys! 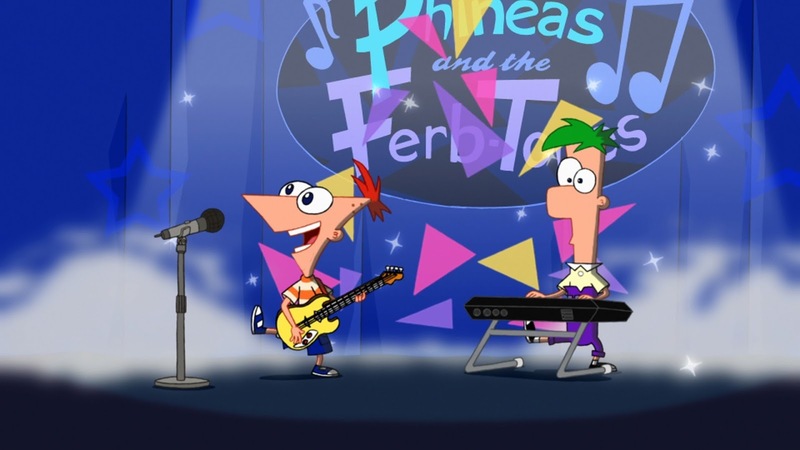 Phineas and Ferb attempt to write a one-hit wonder consisting of a catchy tune and meaningless lyrics in this episode and succeed with flying colors with their song, "Gitchee Gitchee Goo". The boys follow a hilarious checklist to measure their success, including creating a hit record, having a diva tantrum, the hit record becoming elevator music, and ending with a reunion tour. After this episode, songs became a standard component of practically every subsequent episode and "Gitchee Gitchee Goo" still remains as one of the most popular and recognizable songs of the series. Good luck getting it out of your head, but why would you want to?! 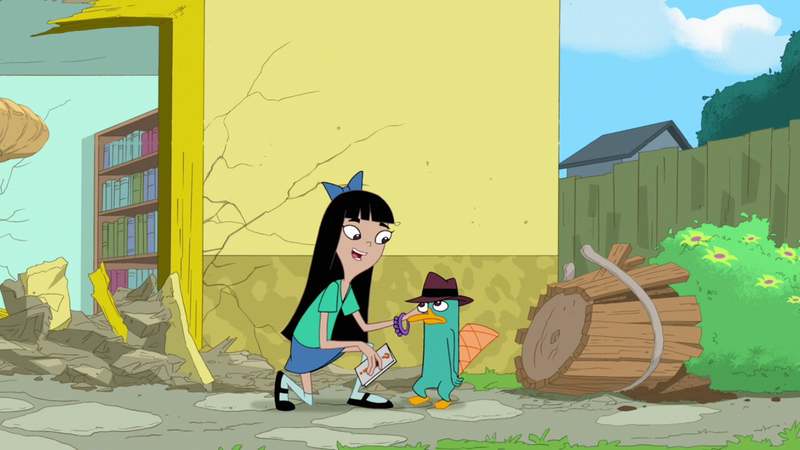 While the boys create a time machine that transports them and their sister back to the age of the dinosaurs, the real gem of this episode is Dr. Doofenshmirtz and Perry. 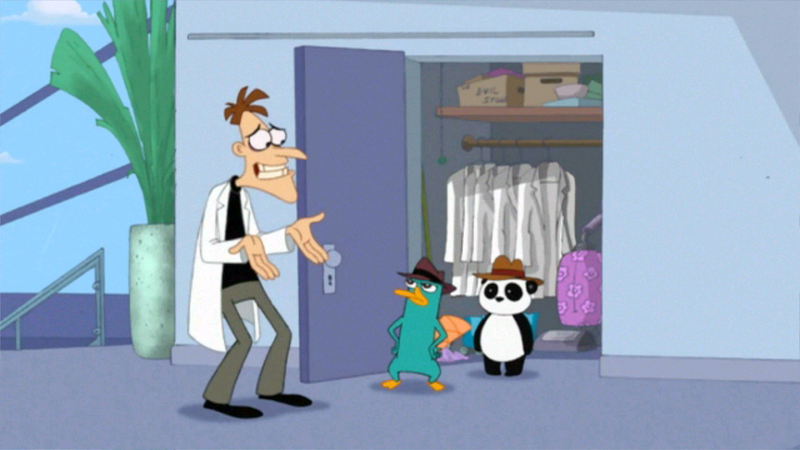 When Perry shows up at Doofenshmirtz Evil Inc. (you totally sang that), he discovers that Dr. Doofenshmirtz has been "cheating" on him with another agent, Peter the Panda. Perry is heartbroken over the apparent loss of his nemesis and this is illustrated through a hilarious yet sad breakup montage set to original song, "When We Didn't Get Along". The two eventually reconcile their differences on a Dr. Phil-esque talk show. 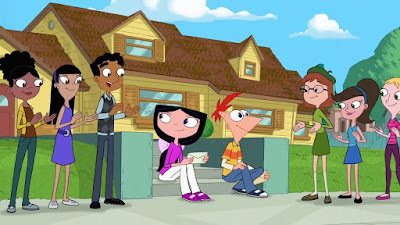 Overall the episode is an excellent exploration of the relationship between Dr. Doofenshmirtz and Perry revealing that they do, in fact, care about each other. When the boys' dad, Lawrence (voiced by Richard O'Brien), forgets his wedding anniversary with their mom, the boys work along with their sister, Candace, to reunite the band, Love Handel, as their farewell concert is where their parents shared their first kiss. Through some incredibly catchy songs such as "I Ain't Got Rhythm" and "Fabulous", they manage to get the band back together for one last concert in the family's backyard. This episode is a testament to the love between Lawrence and Linda (voiced by Caroline Rhea) as well as the love the whole Flynn-Fletcher family shares as Candace is able to set aside her need to bust her brothers in order to make this the best wedding anniversary ever. It's worth mentioning too that the Love Handel song, "You Snuck Your Way Right Into My Heart", is a fantastic 80's-esque rock love ballad. For the first and only time, the main and secondary story lines are reversed. 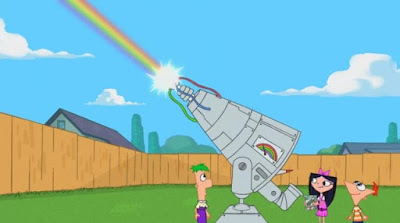 Vanessa, the teenaged daughter of Dr. Doofenshmirtz, seeks to bust him to her mom while Phineas says many of Dr. Doofenshmirtz's lines and even adds on -inator to his invention's name, the Rainbow-inator, which is destroyed by a Self Destruct button when accidentally knocked into by Perry. Probably the most hilarious and memorable scene is one near the end of the episode where Perry lets out the cutest sneeze ever and Phineas shouts, "Bless you, Perry the Platypus!" A fitting twist on Dr. Doofenshmirtz's usual line of "Curse you, Perry the Platypus!" Linda is invited to reprise her pop star persona, Lindana, at an 80's revival concert and Lawrence feels left behind, fearing that he will no longer be cool enough for his wife as he is hopelessly nerdy. In order to help their dad, Phineas and Ferb transform Lawrence into 80's superstar, Max Modem. 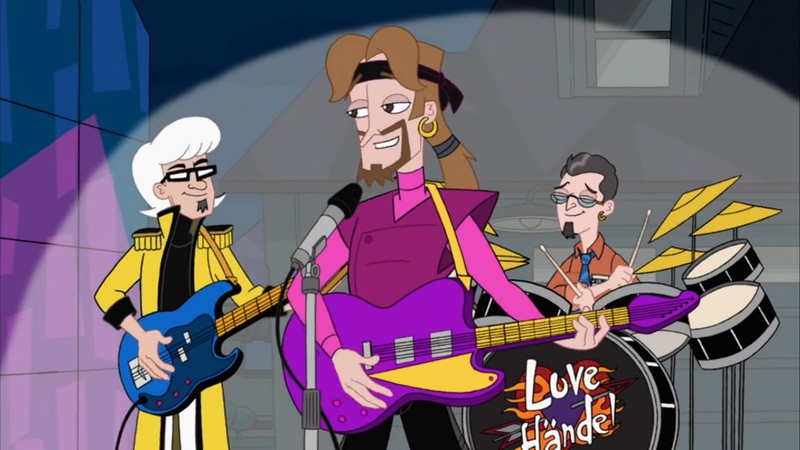 The boys perform with their dad at the concert while Candace performs with their mom and in the end, Lawrence learns that Linda loves him just the way he is. It's a fun episode featuring the whole Flynn-Fletcher family and made all the sweeter when you realize that Lawrence's voice actor, Richard O'Brien, played Riff Raff in The Rocky Horror Picture Show. This is even referenced when Lawrence first steps out in his Max Modem outfit and comments, "You know, I feel strangely comfortable like this." This episode was a brilliant musical revitalization of the series pilot, "Rollercoaster", where Phineas and Ferb build a roller coaster around Danville after deciding to carpe diem their summer. Paying homage to the episode that kicked the series off, the episode features fantastic musical numbers such as "Hey Ferb", "Rollercoaster", and "Carpe Diem". Dr. Doofenshmirtz even has a number, "Back in Gimmeslthump", that is both out there and ridiculously funny especially when we see Perry's reactions during his performance. Ultimately the show's primary message is musically clear that we should all look to make the most of every single day. 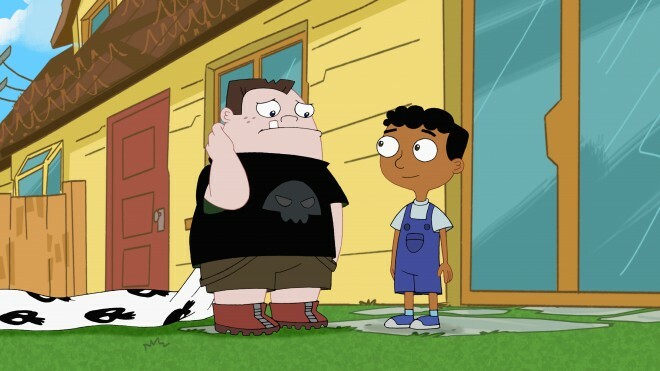 Baljeet (voiced by Maulik Pancholy) and Buford (voiced by Bobby Gaylor) have had a complex friendship since the series started, with Buford first being introduced as a bully of Baljeet's. Over the course of the series, the two develop a friendship in which Buford continues to bully Baljeet to an extent. The tension between them finally comes to a head in this episode where Baljeet declares that he is no longer Buford's nerd, essentially breaking up with him. Buford becomes Dr. Doofenshmirtz's assistant while Baljeet feels incandescently happy and gets Phineas, Ferb, and Isabella to join him on a climb up Danville Mountain with no inventions to help them. We finally see what happens with Phineas when he is not allowed to invent, and the results are priceless. 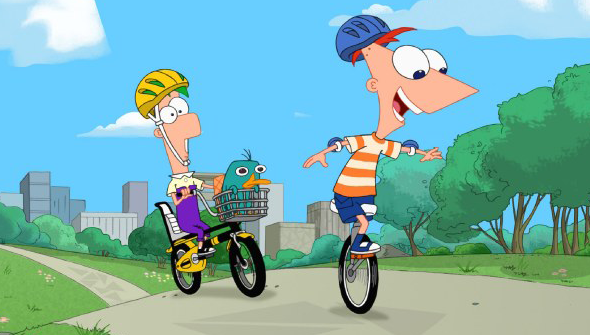 Phineas clearly can't go a day without inventing as he nearly suffers a mental breakdown and builds an ice chalet at incredible speeds once he is allowed to invent again at the top of the mountain. Even his brother Ferb, a boy of few conveyed emotions words, comments that he was about to scream if they hadn't been allowed to invent something soon. The most notable portion of this episode though is the song, "Big Honkin' Hole in My Heart", sung by Baljeet and Buford as they realize that they really do care for and need each other. This sentiment is affirmed by Buford who states as he leaves Dr. Doofenshmirtz to reunite with Baljeet, "There comes a time where you don't want to bully everyone, you just want to bully someone you love." This episode is, for the most part, relatively standard fare surrounding Isabella's birthday and her desire to have some alone time with Phineas, which she eventually gets. The episode becomes momentous because during Perry and Doofenshmirtz's usual daily battle, they crash into Stacy Hirano's house and Stacy learns of Perry's secret identity as Agent P. As the best friend of Candace, one of his owners, having Stacy learn of Perry's identity is a huge occurrence on the series. The entire cast of characters had previously learned of Perry's secret identity in the 2011 movie, Phineas and Ferb: Across the 2nd Dimension, however, they had all opted to have their memories erased as Perry would have to be relocated if his owners knew of his identity as Agent P. Once Stacy learns of his secret identity in this episode, Perry fears that he will be relocated however Stacy points out a loophole in that she is not related to his owners and therefore is exempt. She makes a pact with Perry to keep his secret and while there have been no subsequent consequences of this revelation, we hope it pays off in the series finale! The Star Wars franchise is no stranger to being incorporated into television series, and once Disney acquired Lucasfilm, Dan Povenmire immediately expressed a desire to do a Star Wars crossover with Phineas and Ferb. What resulted was a fantastic special that was essentially a Star Wars love letter from the crew. Chock full of references to Star Wars and containing a high sense of respect for the franchise, this is easily one of the best Star Wars specials ever to exist. The episode even features a light saber duel between Phineas and Ferb when Ferb is turned into a Sith Lord courtesy of Darthenschmirtz's Sith-inator that serves to make your heart ache for these two brothers. 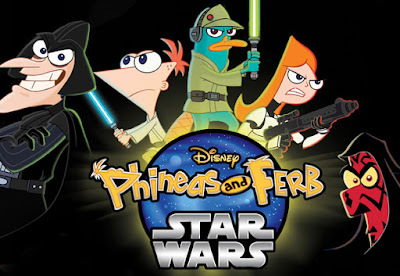 It's a must watch for any Star Wars fan, even if you have never seen Phineas and Ferb. In this episode, we take a 10-year leap forward and see Phineas, Ferb, and the rest of the gang in their late teens. Phineas is faced with deciding what college to go to and the revelation that Isabella has had a crush on him since they were young kids. Having realized that he has a crush on her during their high school years, he sets out to tell Isabella how he really feels before she leaves at the end of the day for college. Their friends band together in order to get the two their happy ending and it's just a really fantastic episode overall. We get closure with many of the characters and find out what's happened with them over the past 10 years. Not to mention it has a really sweet duet between Isabella and Phineas, "What Might Have Been", where they lament about how they should have told each other their true feelings sooner. One of the most brilliant reveals in this episodes is a quick nod to Candace, where we see that she re-focused her incessant need to bust into her studies for a law degree. It's not just the episode itself that makes it special though, but also the fact that the creators hired long-time fan and talented artist, Ashley Simpson, to do the majority of the character designs after receiving a drawing from her at San Diego Comic Con illustrating Phineas and Ferb as teens. Look for our interview with her this coming Monday to learn more about her and her experience on the show!